Last week, I pitted two Q-cars against each other and determined Mercedes was the first of the Germans to nail the recipe for a sedan that looks boring but packs a punch. The 300SEL 6.3 was the beginning, but the W124-based 500E was a high-water mark. I love the W124 and think Mercedes hasn't been able to successfully replace it. Built between 1986 and 1995, this generation of what later became known as the E-class was spectacularly built and could handle a lot of power. Mercedes knew this, which is why they thought it would be a good idea to sink a 5.0-liter V8 into the front of a 300E to make it a 500E. More is, quite often, better. And more results in 0-60 times of around six seconds, which was pretty good 20 years ago for a big sedan with an autobox. In fact, the car had to be limited to 155 MPH, one of the first as the mainstream German automakers made a half-hearted pact to stop ever-increasing power wars. 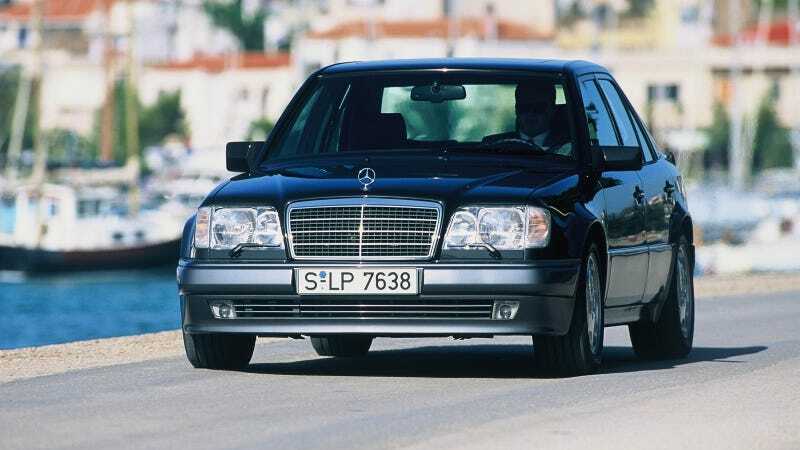 The 500E, launched in 1991, (and later the E500 when the nomenclature was changed in 1994) was a collaboration between Mercedes and Porsche. Rumored to be using secrets from its canceled 989 sports sedan project, it stuffed a lot of mechanicals from the 500SL roadster and turned the W124 cruiser into a bruiser. In a calculated, German sort of way, of course. Like its collaboration with Audi to make the lovely RS2 wagon, Porsche took the 300E the mayor would drive and made it absolutely sinister. E500.org has a wonderfully detailed list of what the sports car maker did, but the gist of it is a 326 horsepower engine, swanky Recaro seats, tasteful body kit and shorter springs that lowered the car by an inch over a standard W124. Porsche even made the 500E at one of its factories, the same specialized house that built the 959. Between 8 and 12 500Es were assembled a day, and they were largely hand-built. BMW stole Mercedes' Q-ship thunder with the E28 M5 and then did it again with the E34, which is unfortunate because I think the 500E is a shockingly underrated automotive great. There is absolutely nothing flamboyant about this car and it really does look like any other W124, which is something you can't say about an M5 or any other hot Merc since. The fenders are subtly bulged, the rear bench seat replaced by buckets with a center console, but it takes a keen car enthusiast to see this isn't just any sedan. This is really how to do a Q-car. The lack of eye candy, though, was kind of a sore point for some reviewers, as Hemming's reflected back in 2007 in a mashup with the M5. The fact the Benz lacks the athleticism of its Bavarian rival becomes much more apparent when they're pitted against each other. "The Mercedes, by comparison, has muscle car written all over it—outsized and quick and effortless, floating you out to sea on a wave of torque," Jeff Koch wrote. And that kind of sums up how Mercedes does a performance car. The 500E's modern-day equivalent, the E63 AMG, is not the last word in handling, but more of a comfy cruiser that happens to have a monster engine bulging out of the front. Those obsessed with balance and poise and really sharp controls look elsewhere. But the 500E definitely has the rarity factor going for it. About 10,000 were built between 1991 and 1995, but only 1,505 of those came to the States. A new 500E was around $80,000 way back when, so the fact a really good one can be had for closer to $20,000 means they're pretty cheap. The 500E, as Autocar rightfully noted in its own retrospective a few years ago, set the tone for the hotted-up AMGs that followed. And it really deserves respect for the way Mercedes has gone about making its hyper sports sedans today. The subsequent C43 and E55 AMGs, and the modern line of hot Mercs, haven't deviated from the 500E formula much. And in a way, the 500E is really the first four-door Porsche – sort of the initial Panamera. Except this is actually attractive. Tell us — would you put a 500E on your garage, or is there a better German super-sedan?